For anyone with reduced mobility the simple things in life can suddenly become very complicated. From shopping errands to simply getting out and about these once simple activities might feel out of reach. Fortunately mobility scooters provide an ideal solution to these problems. So, if you or someone you know is in need of one of these life changing devices read on as we dissect, what we believe, are the best 6 in the UK. 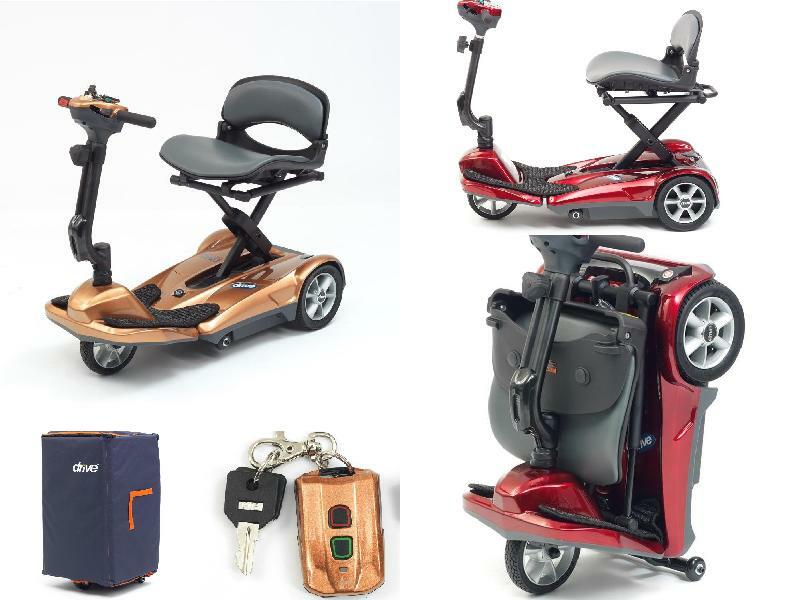 From rugged 4 wheel scooters to maneuverable 3 wheel models and folding, portable scooters to powerful long-range travelers we have chosen a selection to cover virtually every need, budget and performance requirement. Read on to find out more in our ultimate buyers guide to mobility scooters. Since inception in the year 2000, Drive Medical (now re-branded to Drive DeVilbiss) has grown into a global manufacturer of mobility aids that help seniors to maintain an active lifestyle. They have an impressive product line-up for the UK market, but today we’ll be reviewing the Drive Medical Envoy 4 Class 2 mobility scooter. This mid-range unit offers a host of features that are often found on larger and more expensive models. Here’s what we found out about the Envoy 4 mobility scooter from Drive Medical after extensive research on the product. One of the best features of the Drive Medical Envoy 4 is the great level of comfort that this motorized scooter offers. It has an all round suspension system to soften your ride, which is a great feature for people with back problems. The front and rear suspension absorb impact from driving over kerbs and uneven surfaces. As if that wasn’t enough, the Envoy 4 comes with an adjustable padded seat. On the right-hand side below the seat, there is a rotation lever that allows you to swivel the chair when getting on and off the scooter. The chair can rotate in 360-degrees and locks in place after swivelling every 45-degrees. On the left-hand side of the seat, you will find the sliding handle. You can increase the amount of leg room by lifting this lever and sliding the chair back and forth to find the most comfortable position. The armrest width and angle along with tiller height can be adjusted as well to match a user’s preference. There is also a sturdy front mounted basket for storing personal items with ease. Unlike other portable mobility scooters, the Drive Medical Envoy 4 does not come apart. This means it cannot fit into the boot of a car. Operating the Envoy 4 is a breeze. 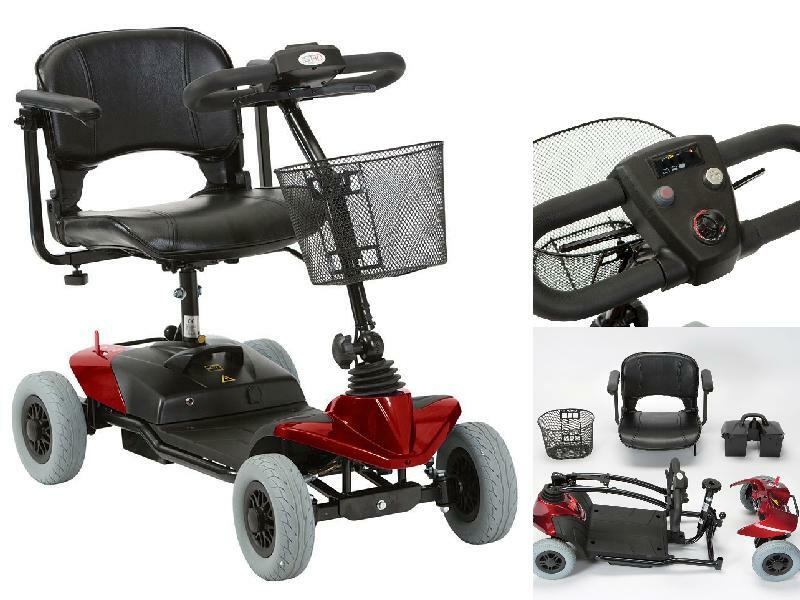 It features a delta style wrap around tiller that is not only more comfortable for longer journeys, but also easier for users who have weakness in the hands or poor gripping. This mobility scooter turns on via a key ignition. The speed dial is the first control to configure after powering up the scooter. You can turn this knob clockwise and anti-clockwise to increase and reduce the top speed respectively. Alternatively, you can swap between the high and low-speed setting at the flick of a switch. The low-speed setting is ideal when driving in a pedestrian environment. A couple of wigwag paddles propel the scooter forwards and backwards when pulled. To stop, all you have to do is release the wigwag paddles and the electromagnetic brakes automatically engage. The brakes can be completely disengaged using a freewheel lever found on the rear side of the scooter. This comes in handy when you want to manually push the scooter to park or retrieve it from storage. From a safety perspective, the Envoy 4 does not disappoint. It offers controls for a headlight, horn and reducing the speed. Front mounted indicator lights can be turned on at the push of a button to show your direction of travel when making a turn. There are even side and rear reflectors on the scooter to keep you visible when driving in the dark. The hazard warning switch that flashes all indicator lights and sounds the horn is an added safety bonus for drivers to use upon detecting oncoming danger. Like most mobility scooters, the Envoy 4 has anti-tip wheels to stabilize the scooter when cornering. It can climb inclines of up 8-degrees but the recommended safe user-weight reduces when going up on sloping surfaces. On flat terrain, the frame easily supports a maximum of up to 160Kg (25st) user-weight. The most appealing feature of the Envoy 4 mobility scooter is an impressive 50AH battery. If you intend to only use the scooter for short journeys, it can go for days without needing a recharge. Also, the large capacity battery gives you the peace of mind knowing that it won’t die suddenly on longer trips. It can offer up to 30 miles travel range in one charge but keep in mind that this depends on other factors such as your weight and terrain the scooter will travel on. The battery charges on-board by connecting the provided power cord to a wall outlet and a charging socket cap located on the scooter tiller. Once fully charged, the scooter shows how much power it has left at all times via a convenient gauge found on the tiller. The Drive Medical Envoy 4 mobility scooter is not portable. So, you cannot travel with it. Who Should Buy the Drive Medical Envoy 4? Although this motorized scooter is more on the bulky side, it more than makes up for it with a powerful battery, extra long range and comfortable all round suspension system. For people who don’t want a transportable option without paying a premium for an 8mph scooter, the Drive Medical Envoy 4 class 2 mobility scooter makes an excellent choice. However, if you are looking for a portable mobility scooter, the Envoy 4 is not your best option. Pride Mobility is one of the leading manufacturers of mobility scooters in the world. And, as you would expect from a top brand, they offer a wide range of power scooters to suit different persons who have difficulty getting around. In 2002, their Go Go scooter was the first four-wheeler of its kind that could fold up easily. Since then, the company has redesigned the Go Go Travel Mobility scooters, which now maintain the same compact size but with easy, feather-touch disassembly. The Go Go Elite 4-wheel scooter, which will be the focus of our review here, is an improvement over the previous 3-wheeler version. Designed with greater stability in mind, this scooter makes it possible to tackle tough terrain in outdoor settings. The 4 wheel Go Go Elite Traveller comes apart into five pieces. These include the seat, front mounted tiller basket, motor/transaxle assembly with rear wheels, front section with an attached tiller, and battery pack featuring a handle. When taken apart, the scooter easily fits in the boot of a medium to large size car. Assembling it is not difficult thanks to a simple latching mechanism that requires minimal effort to lock everything back together. Cushioned with moulded foam, the vinyl covered seat of the Elite Traveller provides supreme comfort. The seat even has armrests and you can adjust its height as well as rotate it to get on and off the scooter easily. There is a release lever that goes through the seat stem and mounting bracket, which locks the seat in place when driving. What’s more, the tiller pivots at the bottom, allowing you to tilt it downwards or further away from the seat depending on the reach of your arms. All you have to do is simply turn the oversize, round wheel-like knob at the bottom of the steering column to lock the tiller in place or loosen it for adjustments. Pride mobility scooters are usually designed with simplicity in mind. The Elite Traveller is no exception since you will only need to adjust 4 controls when driving the scooter. A key switch turn the scooter on or off. There is also a press activated horn on the tiller and speed adjustment dial. By turning the speed dial to point at the ‘hare’ or ‘tortoise’ icon, this allows the scooter to move at the fastest or slowest speed respectively. When you push the right throttle lever, the scooter moves forward, and pushing the left throttle control reverses the scooter. The scooter comes to a halt when you release the throttle levers, so there are no complex braking controls to fidget with when you want to slow down or stop. Other than the speed limiter, horn and automatic braking system, this mobility scooter has a couple of extra features that help to keep drivers safe. For starters, you need to be under 137Kg (or 21.6St), which is the scooter’s weight limit. In addition, two anti-tip wheels bolted to the frame at the rear of your Go Go Elite 4-Wheel Traveller help to improve stability. The 4-wheeled Pride Go Go Elite Traveller mobility scooter comes with a standard 12Ah battery pack, which charges on or off the unit. A convenient colour coded battery condition meter on the tiller lets you know when to recharge your scooter. According to the manufacturer, you can expect a travel range of up to 9.67km (6 miles) from the 12Ah battery. Keep in mind that how far the scooter can go on a full charge will depend on the terrain you are driving on and your weight. If you need longer charge life, consider going for the optional 18Ah battery pack instead, which has a larger capacity. 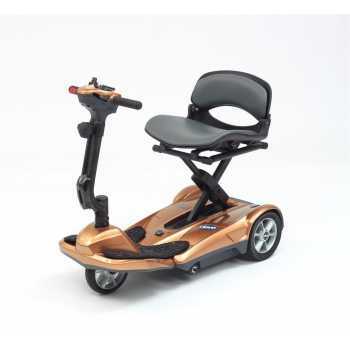 Since this Pride Mobility Go Go Traveller scooter features sealed lead-acid batteries, you can take it with you when travelling by plane. When going over big bumps, the battery can jump of its contacts and stop the scooter from working. Wrapping a cord or rope around the battery and scooter base prevents this problem. Who Should Buy the Pride Go Go Elite Traveller 4 Wheel Scooter? 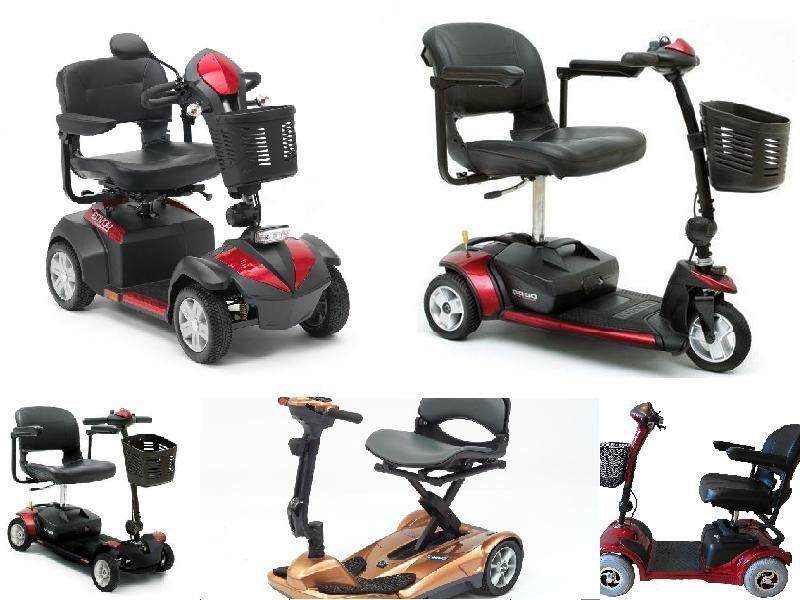 It is easy to get confused over which scooter to buy when looking at Pride Mobility units since there are so many options from which to choose. However, the Pride Go Go Elite Traveller 4 wheeled scooter would be ideal in situations where stability is of prime importance. This class 2 scooter has a speed limit of 4mph, so it is suitable to use along footpaths. Its four wheels with anti-tip tires make it a good scooter for getting around your neighbourhood when running errands. The scooter packs into a compact size when dismantled and reassembles fast, which will come in handy when getting to a destination that will involve driving in a car. Overall, the Pride Go Go Elite Traveller 4 wheeled scooter is well built, easy to use, and does not skimp on safety. The limited lifetime warranty on the frame and 2-year warranty on electronics & drivetrain are two extra reasons why buyers would not want to pass up this mobility scooter for something else. The Explorer 4 is an amazing power scooter that can improve the quality of life of people who have difficulty moving around. It combines the best features of class 2 and class 3 scooters with a portable design to offer what is arguably one of the best performing units in the market. Thanks to this build, the Explorer 4 offers enough manoeuvrability to fit into tight spaces as well as a solid build that will handle sloppy roads and pavements with ease. To top it off, this scooter covers an impressive 18 miles before you need to recharge the battery. Read on to find out more about the long list of wonderful features that this mobility scooter has to offer. The Explorer 4 is easy to use right off the box. It is built to dismantle into four separate parts (main section, seat, battery, & tiller) – a design that makes assembly as simple as possible. This can be done in less than 30 seconds provided the person doing the assembling does not have strength or dexterity issues. Another thing to love about the Explorer 4 mobility scooter is the utmost comfort it offers to users. 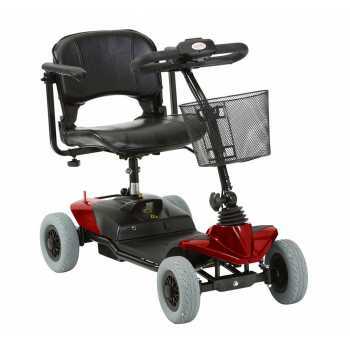 Both the tiller and padded seat feature a great range of adjustability, which ensures that users of all heights and sizes not only remain extremely comfortable, but also allows them to easily access the unit’s controls without straining. The scooter also comes in a size that is large enough to ensure users remain comfortable and avoid cramping during long journeys. Operating the Explorer 4 is very simple. The tiller is infinitely adjustable while a single lever controls main functions, which include speed, braking, and direction of travel. There is also an easily accessible horn/buzzer, free-wheel reverse lever, and a steering lock mechanism for secure storage. Assembling and dismantling the Explorer 4 is just as easy as operating it. The four components of the scooter unlatch effortlessly and snap back together seamlessly. When it comes to safety, the Explorer 4 does not disappoint. To begin with, this scooter features a horn and safe speed limit of 4mph. Its easy to use control system allows you to slow down when necessary. There is a battery level gauge as well, which helps to avoid a scenario where you end up stranded far away from home with no juice left in the tank. What’s more, anti-tipper rear wheels keep the scooter stable on inclines and other rough terrains. The tires are also pneumatic and as such absorb shock to provide jolt-free rides. Even the seat is designed with 360-degree rotation to help ensure users get on and off the scooter safely and with ease. Who Should Buy the Explorer 4 Mobility Scooter? The fact that the Explorer 4 mobility scooter is manoeuvrable enough to safely mingle inbetween people on busy streets as well as portable and more stable than the average pavement unit makes it a good fit for just about anyone with mobility issues. Therefore, whether you want a scooter for carrying out errands, going around the neighbourhood, or making long journeys like a visit to the park, the Explorer 4 might be just what you’re looking for. Carrying this scooter with you during overseas trips is even possible owing to its compact design. There are lots of power scooters available these days and one quality product from a reputable brand is the Drive Medical Megatronn Automatic Folding lightweight mobility scooter. This piece of equipment is simple to operate, comfortable and easy to bring with you on the go. It is not the cheapest portable mobility scooter out there, but the relatively higher price tag comes with plenty of useful features that offer good value. 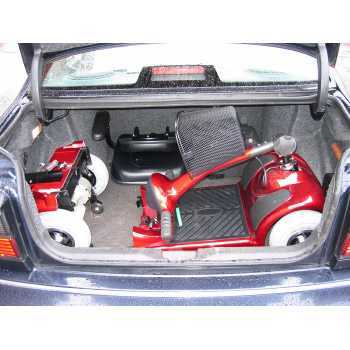 To provide good riding comfort, Drive Medical manufactures their auto fold mobility scooter with a padded seat. What’s more, the handlebar can slide up and down to a height that users find comfortable. Turning a large knob in front of the tiller helps to release and secure the handlebar when making height adjustments. With no parts to dismantle and reassemble, the Megatronn is a joy to transport. It comes with a soft padded carrying bag that offers protection during transportation. The most impressive feature of this portable mobility scooter is its ability to fold up and open out as one compact piece. You can control the folding and unfolding action at the press of a button using the provided remote. 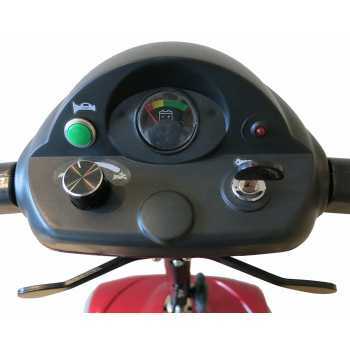 Pressing down the green and red buttons for three seconds, which are found at the back of the scooter, instigates the automated unfolding and folding action respectively. The manual buttons come in handy should the remote control batteries die. Weighing only 20Kg, the Megatronn auto fold is one of the lightest mobility scooters we have seen. We also love how the scooter can be rolled away on its anti-tip wheels or front tyre when folded up. Both of these features make it easy to load the scooter in and out of a car boot. As with most mobility scooters, the Megatronn provides all operation controls on a central tiller console. The tiller, mounted on straight handlebars, houses controls such as the light switch, horn button, and battery gauge. A key ignition turns the power on when you want to fold, unfold or drive the scooter. When powered up, the battery gauge backlight turns on. Turning the speed adjustment dial clockwise increases the speed at which the scooter will travel, which reach a maximum of 4mph. To accelerate, all you have to do is pull the right-hand side (or red) wigwag paddle towards the handlebars. Pulling the left-hand side (or brown) wigwag paddle reverses the scooter. The harder you press either paddle, the faster the scooter moves. This means that Megatronn can slow down if you partially pull the wigwag paddles. Releasing these controls engages the electromagnetic brakes, bringing the scooter to a complete stop. The Megatronn offers more safety features than what you would find in other cheaper portable models. Buyers receive the standard feature set of a horn, braking mechanism, anti-tip wheels, which are found between the front and rear tyres, as well as the ability to limit speed. In addition, this scooter is designed to be extra safe in the dark thanks to its flashlight. It also has a skid resistant carpet that prevents slipping off the footplate. Other safety features provided include automatic speed reduction when cornering and an anti-rollback mechanism that kicks in to prevent the scooter from rolling back on an incline. An 11.5AH lithium-ion battery pack powers the 180W motor of the Megatronn. The battery is airline friendly, which is a bonus for people who wish to travel with their mobility scooters in abroaf. It’s capable of providing enough power to cover 6-miles when fully charged. The on-board charging system that comes with this scooter only allows users to recharge the battery without removing it. The Megatronn also features an easy-to-use charger. Its charging adapter has LED lights that illuminate in different colours to indicate a full battery and when charging is in progress. The LED lights also flash upon detecting any voltage/current faults. Included in the package is an emergency charging cable as well. This power cord allows charging when the battery is completely flat and the scooter’s standard charging socket cannot be accessed while the entire unit is folded up. Who Should Buy the Drive Medical Megatronn Mobility Scooter? 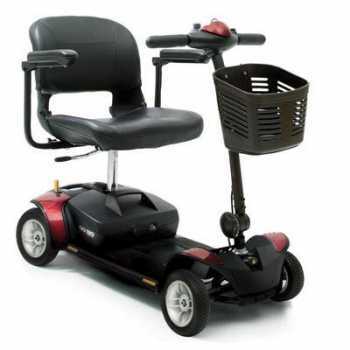 While three-wheeled scooters are more suitable to use indoors, this unit from Drive Medical handles outdoor terrain fairly well. It can climb ramps and slopes with a gradient of 10-degrees or less. With a speed limit of only 4mph, the Automatic mobility scooter can only be driven on pavements if you intend to use it outdoors. Overall, it is perfect for people who are looking for a compact motorized scooter to use at home, whilst shopping, and when travelling. The ST1-D mobility scooter is another fantastic product from Drive DeVilbiss (formerly Medical Drive), which has earned rave reviews from buyers. This piece of equipment delivers high performance and easy disassembly for convenience on the go. It’s an improvement of the former ST1 mobility scooter, now featuring a wider frame and upgraded ground clearance of 1.8 inches. In this guide, we’ll go over everything you need to know about the ST1-D mobility scooter, including the good and bad, so that you can make an informed buying decision. The STD1 can be disassembled for transportation. Although a sturdy pair of hands is required for this. The ST1-D is designed with user comfort in mind. It allows repositioning of the tiller angle and seat height so that users can reach the tiller controls easily while driving. The tiller adjustments are made by turning a hand wheel knob found above the front tyre rather than a lift up lever as is the case on the earlier ST1 model. When turned counterclockwise, the knob loosens the double stem bar, allowing you to tilt the tiller to a comfortable angle. Rotating the adjustment wheel in clockwise direction locks the tiller column in place. 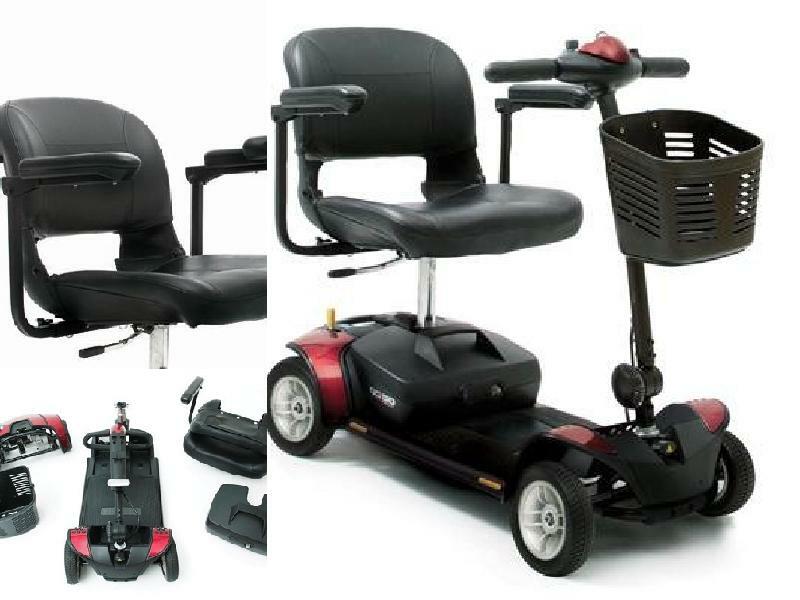 For added comfort, the seat mounted on this mobility scooter has cushioning, a backrest and width adjustable armrests. Plus, climbing on and off the scooter is easy thanks to the full 360° rotating seat. As you would expect from a portable, boot scooter, the ST1-D comes apart into pieces. Lifting a fixation pin behind the seat post allows the front and rear frame to be separated into two pieces. You can fold the tiller towards the seat until they are parallel to the floor plate. The scooter can split into five smaller parts for easier lifting when loading into a car boot. Removing the seat simply involves pulling the release lever on the right side and pulling it up and away from the scooter. You can fold the backrest to make more room for other scooter parts that will go into the car boot. The battery pack comes right off the scooter by pushing a release lever on its top side and pulling it up by the attached carry handle. You can also unhook the front mounted basket and place it in the back car seat or have a passenger hold it since it is the lightest part. The ST1-D comes with a delta style handlebar and simple to use dashboard. Its key ignition acts as the power switch for the scooter. Once turned on, you can configure the scooter speed before driving off. By turning the adjustment dial until the selector aligns with the hare or tortoise icon, you can choose to drive at the top or low-speed setting respectively. Two thumb levers on either side of the tiller propel the scooter in a forward and reverse motion when pushed using your thumbs. Releasing these levers triggers the scooter brakes. A battery gauge comes as standard as part of the tiller controls, which lets you keep an eye on the battery power while driving. On the back of the scooter, you will find a freewheel lever that cuts off the power supply and disengages the brakes. This helps to conserve battery life since you don’t have to turn the scooter on when you want to manually push it to a parking spot or when retrieving the scooter for driving. When it comes to safety, the ST1-D offers stabilizing anti-tip wheels on the rear tyres and a horn to alert pedestrians of your presence. Although there is no headlight control on this scooter, it has a tiller console that illuminates and reflectors on the back that work to improve outdoor visibility in the dark. What’s more, an anti-rollback function keeps the scooter from reversing when driving up a slope. With a user-weight limit of 18St (115Kg), the ST1-D is suitable even for heavy individuals. Keep in mind though that the safe user weight limitation drops when driving up inclines. The recommend safe slope gradient for this scooter is only 6o°. Like most mobility scooters from Drive DeVilbiss, the ST1-D model allows you to charge the battery on the scooter or off-board. When LED lights on the charging adapter shine in yellow or red, this indicates that charging is in-progress. The LED lights turn green once the battery fully recharges. With the 12V battery pack system on this scooter, you get a capacity of 12AH. This is capable of providing enough power to cover distances of up to 6 miles in between charges. Who Should Buy the ST1-D Mobility Scooter? Capable of reaching maximum speeds of 4mph, the ST1-D portable mobility scooter qualifies as a class 2 invalid carriage that is allowed to be driven on pedestrian pavements. In outdoor settings, the scooter offers the added stability of four wheels and a ground clearance that allows you to drive over very low kerbs of 1.5-inches in height. Overall, this is a good budget choice for people who want a transportable motorized scooter for outdoor usage. Choosing a mobility scooter can be tricky. There are endless brands and models to pick from, and this can leave even an experienced buyer not knowing what to select. However, if you are looking for something that you can go anywhere with, look no further than the Pride Go Go Elite Traveller 3 wheeled mobility scooter. This lightweight, manoeuvrable piece of equipment comes apart easily and is very simple to put back together. 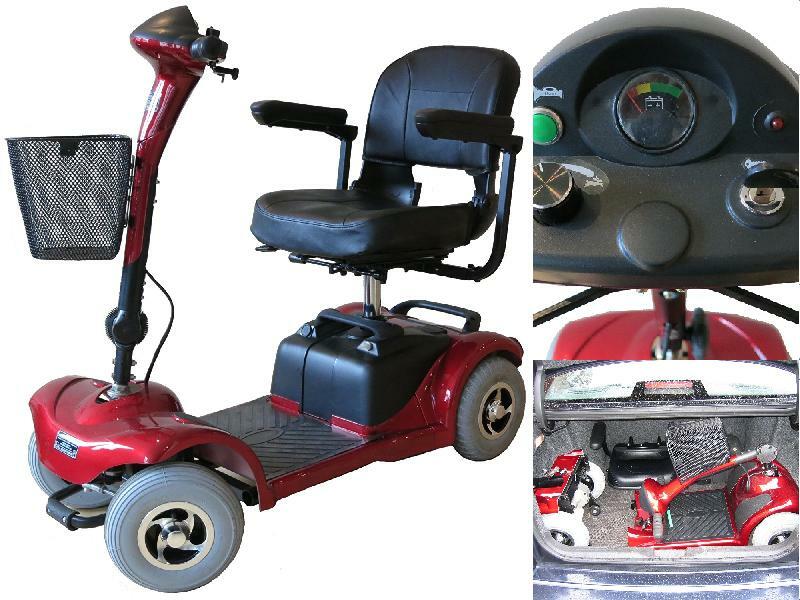 It comes with interchangeable shroud panels finished in red, blue and silver, allowing you to change the colour of your mobility scooter at will. Best of all, it is an affordable mobility aid packed with innovative features. 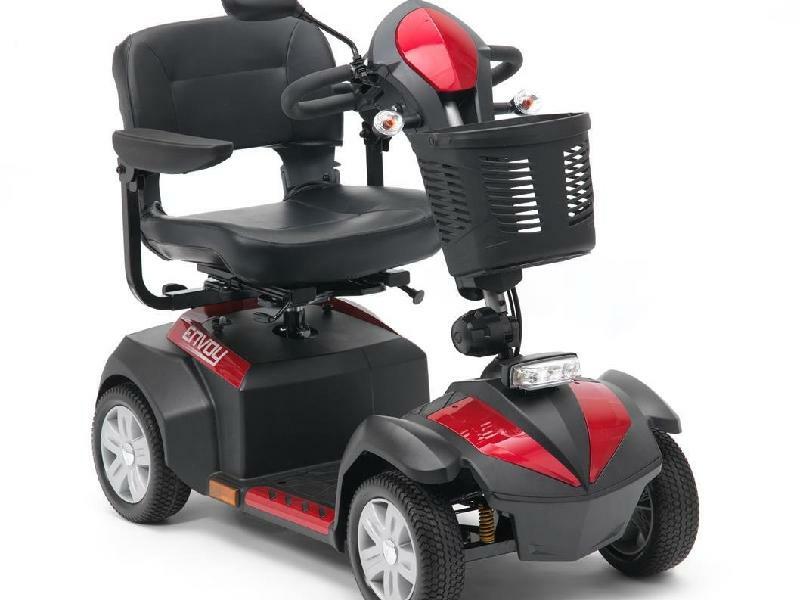 Featuring a cushioned seat, this Pride Mobility power scooter is comfortable to sit in especially over longer periods of use. It has a host of comfort adjustments as well, which help drivers to operate the scooter with ease. You can rotate the seat to get on and off easily by simply pulling and releasing a lever attached to the side of the seat post. The seat height and armrest width can be adjusted too. In addition, the tiller may be repositioned to a comfortable distance by lowering or pushing it towards the seat. Once the tiller is in a comfortable position, you can secure it in place by tightening a round knob located just above the front wheel. Just like other power scooters from Pride Mobility’s Go Go Elite Traveller range, this model comes apart in five pieces. You can pull the seat right off after disengaging the rotation lever. The seat’s backrest folds up plus both armrests may be removed for the scooter to fit easily in the boot of a car when disassembled for transportation. Underneath the seat, there is a battery pack that lifts right off the scooter floorboard. A convenient basket attached on hooks also pulls right off the tiller frame. The rear wheels with motor assembly separate from the front section by simply lifting up the frame release lever behind the seat post. All you have to do when putting the scooter frame back together or taking it apart is hook the front section to the lower frame tube of the rear motor/transaxle assembly. Elite Traveller scooters from Pride Mobility feature a standard straight handlebar, which is what you will find on the 3-wheeled model. The handlebar houses all the tiller with all controls you need to drive your scooter. To power up the 3-Wheeled Pride Go Go Elite Traveller scooter, you have to insert a key into the key switch and turn it clockwise. Turning the dial on the tiller console allows you to select the desired speed. The scooter can move forward or backwards by pressing the right and left throttle control levers respectively using your thumbs. There are also left and right hand-grips you can pull to steer the scooter around corners. The tiller console also houses other controls such as the horn button, battery condition meter and charging receptacle for the power cord. On the top right of the rear section, there is a freewheel lever that cuts the power and disables the drive system and brakes. You can push this lever forward when you want to manually push the scooter for short distances. 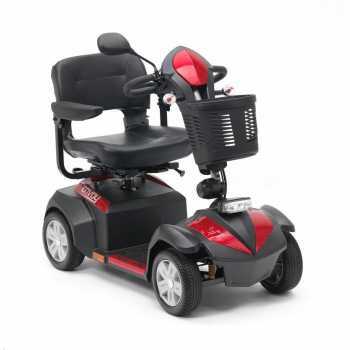 Like with other versions from this range, the 3-wheeled Elite Traveller offers several features that promote safety. To begin with, anti-tip wheels bolted to each rear tire keep the scooter from turning over on sharp corners. When driving the scooter around people, you can limit the speed to avoid collision accidents. In addition, the scooter is designed to allow for easy braking. Engaging the brakes simply requires the driver to release the thumbs from the throttle control levers. The Pride Go Go Elite Traveller 3 wheeled mobility scooter comes with a standard 12AH battery. For longer travel range, it is advisable to go with the 18AH battery pack. A colour coded meter on the tiller helps to keep track of how much battery strength you have left at all times. The 12-volt battery packs that power this mobility scooter all feature a carry handle and charging port. There is also another charging receptacle on the tiller, which means you can charge the battery while it is on the scooter or carry it with you to a wall outlet. Who Should Buy the Pride Go Go Elite Traveller 3 Wheeled Mobility Scooter? 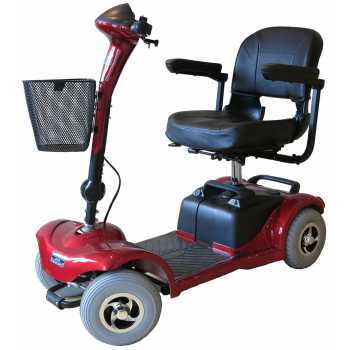 Three wheel mobility scooters such as this one from Pride Mobility are best suited for indoor areas. The Pride Go Go Elite Traveller 3 wheeled mobility scooter will come in handy when you want to move around supermarkets, the public library or inside your home. Its turning radius of just 33-inches makes it possible to negotiate through hallways, shopping aisles, and tight spaces with ease. Overall, this scooter offers good value for the price given that it is well designed and packed with features that allow people with mobility challenges to get around easily and safely. Life does not have to come to an end just because your doctor has forbidden long walks. By simply investing in a mobility scooter, you will be able to maintain an active lifestyle without having to rely on friends and family to drive you everywhere. A lot like a cheap car that is safer and easier to handle, mobility scooters have excellent maneuverability that allows them to fit just about anywhere. Owning one means you can do everything from making grocery runs, to driving to your favourite socialising spots, to taking a simple ‘stroll’ outside. With mobility scooters coming in different types, varying price ranges, and ever-evolving technologies, it is important that you think about what will suit you before obtaining one. This guide offers a few pointers on how to choose a mobility scooter that will best match your needs and circumstances. 1 How do you Plan on Using your Scooter? This is probably the easiest part of choosing a mobility scooter. Knowing what the scooter will be used for makes it easy to choose the right model. Do you want a product you can use every day or something you will pull out occasionally? Will you be using the scooter for short or long trips? Is the area you will be using the scooter frequented by people or cars? The answers to these questions will help steer you in the right direction as there is a mobility scooter made for every purpose. For instance, class 2 scooters are restricted to pavements and footpaths while class 3 models are designed to be road-worthy. Alternatively, class 3 scooters feature a design that allows them to cover longer distances and move at higher speeds than other models. 2 What Terrain will the Scooter Cover? This is another concern that will be determined somewhat by your address. By determining the what the terrain is like around your home and if you want to use it outside, you will be able to select the most suitable model. Basically, the more stable a scooter is, the better equipped it will be at handling rough terrains like gravel or a bumpy dirt road. And, the good news is that there is more than one way of determining the level of stability a scooter can offer. A good indicator of stability is the number of wheels on a scooter. Three-wheeled scooters offer lighter steering that makes them highly manoeuvrable but poor at absorbing bumps on the road. This makes 4-wheeled versions, which have better traction, more suitable for rugged terrains and hilly areas. In the same way, scooters with a rear wheel drive unit or large tires offer better traction than units with smaller tires and a front wheel drive. Considering the above factors allows you to choose wisely when it comes to the performance aspect of a scooter, which in turn brings you one step closer to zero in on the perfect unit for you. However, you still need to ensure that the scooter you choose fits you as an individual. For this, you will need to consider your physique when choosing a scooter. Options usually include small portable scooters (ideal for petite frames), medium-sized units (for average sized individuals), and large scooters (with user weight limits of up to 220kg) which are perfect for taller or heavier people. 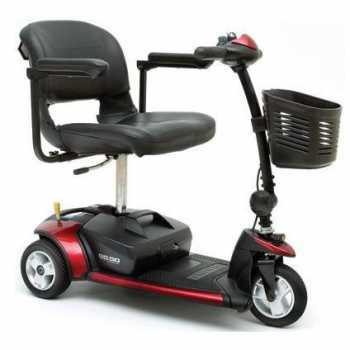 Another way to go when wondering how to choose a mobility scooter that is ideal for your physique is to look at the design. For instance, 3-wheel scooters are perfect for tall people as they offer more legroom than their 4-wheeler counterparts. Alternatively, some models feature large base dimensions, which are designed to provide extra footrests for people with longer legs. You can even find mobility scooters with seats that adjust to match just about any user height. 4 How Adept are you Technically? When it comes to controls, mobility scooters vary greatly. Control options include everything from thumb levers, to joysticks attached to the armrest, to loop handles or steering wheels. So, make sure to choose a unit you will be able to handle easily. Since mobility scooters come with a wide range of features, it is up to you to decide which ones are most important to you. 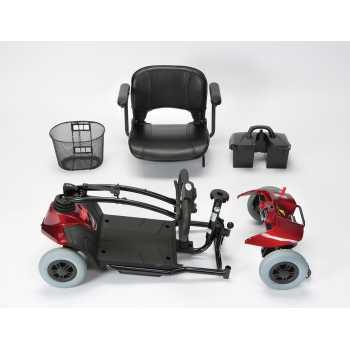 Some of these features include padded swivel seats and armrests for extra comfort, a carrier box for holding things like handbags and shopping items, drink holder, and visibility flags. Some even come with cool accessories like sun canopies, a storage area for crutches and other walking aids, and oxygen tank holders. Check the dimensions of the mobility scooter you would like to determine if it will fit through the storage area or doorways in your home. The weight of the unit is also an important feature to check if you plan to take your scooter on the move. Ideally, portable mobility scooters are designed to come apart or fold up into compact units that fit in the back of a truck or car trunk to make transportation easy. If safety is a big priority, look for features such as speed limiters, safety belts, brakes or anti-tipping fixtures on rear legs, which increase stability on sharp corners. Since most motorized scooters run on direct current, it is important to consider battery capacity before making a purchase. The battery capacity affects travel range. Therefore, the larger a battery is the more range you will be able to travel before needing to recharge it. Most manufacturers specify the range that their mobility scooter batteries can deliver. For those planning to travel long distances, a large capacity battery with long travel range would be ideal. Mobility scooters are not built the same, so make sure to pay attention to construction materials as well. For instance, other than eyeing scooters with sturdy bodies, consider what type of tires various units have. Inflatable tires offer a very comfortable ride but they are prone to punctures. On the other hand, solid (usually foam filled) tires are puncture-proof and require little maintenance but the ride experience is not as smooth compared to their inflated counterparts. Last but not least, be on the lookout for mobility scooters that come with warranties. This will offer you peace of mind knowing that your purchase can be returned or switched in case of manufacturer defects. Keep in mind though that warranty terms vary depending on the brand so make sure to read the fine print. As you can see, mastering how to choose a mobility scooter simply comes down to matching the needs of the rider to the features offered by a given scooter. Therefore, if you take the points discussed here into consideration, you should be able to find the best mobility scooter for you. Mobility scooters (also called power scooters) allow people who are unable to walk to get around more easily. 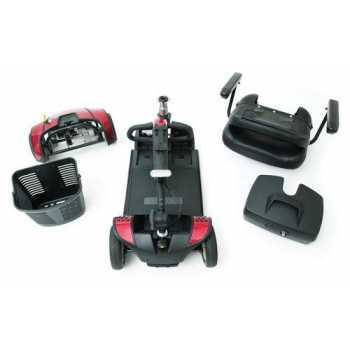 These units consist of a motorized rear axle that is powered by an electric system with a rechargeable battery. 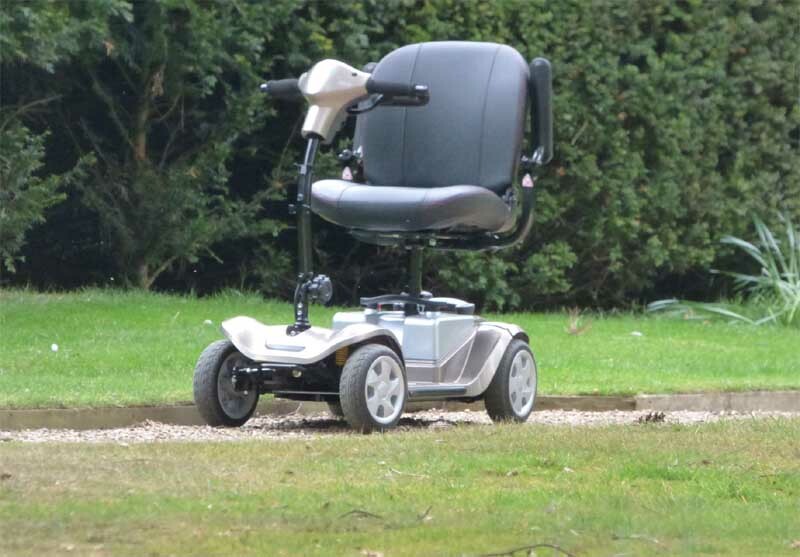 They also feature wheels, a seat and a flat base for feet to ensure riders remain comfortable during use. While mobility scooters feature the same general design, types vary greatly. Some are lightweight and compact, making them a fantastic for getting around the house, neighbourhood, and other flat terrain areas. Others are heavy and wide making them better suited for coping with longer journeys that may require getting on the road or driving up and down kerbs. However, regardless of the look or design, the different kinds of mobility scooters can be divided into the following 3 main categories. The department of transport in the UK categorizes mobility scooters based on their design, speed, and usage. First on the list are class 2 scooters. These are small, lightweight, and designed to be used on pavements and footpaths. They are also the cheapest of mobility scooters. So if you live in a high street where access to shopping areas, banks, and local hangouts, does not involve driving on a road, a class 2 scooter can be a good choice. One advantage of class 2 scooters is that they are extremely lightweight in nature. This makes them very easy to lift and handle. However, because of this small and light build, these scooters cannot be used to tackle long distances. Their battery life is short and they can get uncomfortable when used for too long. Another distinct feature of class 2 scooters is that they cannot exceed speeds of 4mph, which is actually the regulated stipulation for ensuring a scooter can safely navigate between people who are on foot. Designed with rougher terrains and long journeys in mind, these are the complete opposite of class 2 scooters. They are large, heavy, and highly stable – a build that makes them suitable to be used on roads. Class 3 scooters are also built to move at speeds of up to 8mph to ensure you get where you are going quickly. Since class 3 scooters are designed to use on long journeys as well as on the road, they come with all the bells and whistles necessary to ensure riders remain safe and comfortable during rides. These include extra padded seats, bases with extra legroom, indicators, horns, and hazard lights. To top-it-off, class 3 scooters features large capacity batteries that can go for long distances without requiring a re-charge. It is important to note that Class 3 mobility scooters come with a few legal restrictions. For instance, you must register a mobility scooter that falls in this category with the Driver and Vehicle Licensing Agency (DVLA). In addition, persons under 14 years of age are not allowed to drive one of these mobility aids. These are actually a sub-category of mobility scooters and can either fall under the class 2 or class 3 category. Portable scooters get their name from the fact that they can be folded or dismantled into a small size that will fit in the boot of your car. Foldable boot scooters feature a collapsible design that allows them to be reduced to a compact size. Some can even be wheeled away like a suitcase once collapsed. Aside from their portability, foldable mobility scooters have the upside of being able to fit into a plane’s hold. Dismantling scooters, as the name suggests, come apart. They are designed in such a way that several sections of the scooter can be taken apart for easier portability. 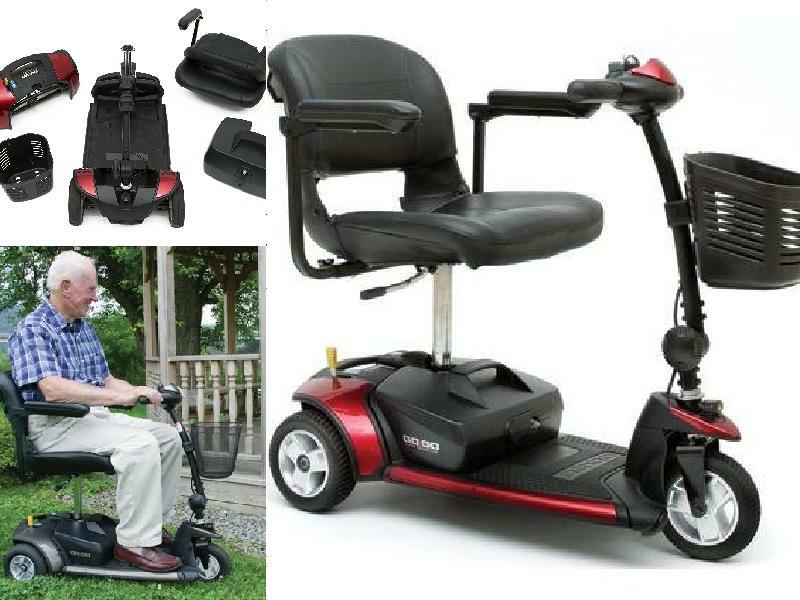 While this design makes it easier to take a scooter on road trips, the dismantling and reassembling part of the design can be challenging to an elderly user with reduced physical strength. One similarity between both foldable and dismantling scooters is that they are heavy to lift even when reduced to a compact state. This means that an elderly individual will need the assistance of an able-bodied person whenever taking out the scooter to use it. 3-wheel scooters – feature 2 wheels at the back and one in front. 3-wheeler scooters are designed with a tight turning radius that makes for easy maneuverability indoors. They are also known for offering more legroom than other scooter designs. 4-wheel scooters – have 2 wheels at the back and 2 at the front. The additional fourth wheel increases stability thereby ensuring a smooth ride on uneven surfaces and outdoors. For this reason, the 4-wheeler design is mostly featured on boot and class 3 scooters. Whether you cannot walk or find it difficult to cover long distances on foot, a mobility scooter is a tool that can greatly improve your quality of life. And, the first thing you will need to decide when looking to invest in one is the type of scooter to buy. Knowing the different kinds of mobility scooters that exist as discussed above will help you to choose one that is designed to meet your specific needs. Read comprehensive reviews & money saving guides on the products & services that matter to you. Disclosure: We are a professional review site that receives compensation from the companies whose products we review. This helps support the site & keep it ad free but never affects our opinion. All the information you read here is fair and unbiased.